WP Plus is designed exactly like the design of Google plus. It is a 3 column WordPress theme with two sidebars and one content area. One sidebar is on left and the other is on right. The theme loads really fast because it don’t uses any graphics at all. WP Plus is compatible with WordPress Custom Menus and Custom Background. You can easily change the links that appear in the navigation bar from the dashboard page without editing the coding of the theme. You can also change the background from dashboard if required. Download and extract the wp plus.zip file to your hard disk. Now upload the wp plus folder to ‘http://yourblogname.com/wp-content/themes/’ directory using any FTP program. 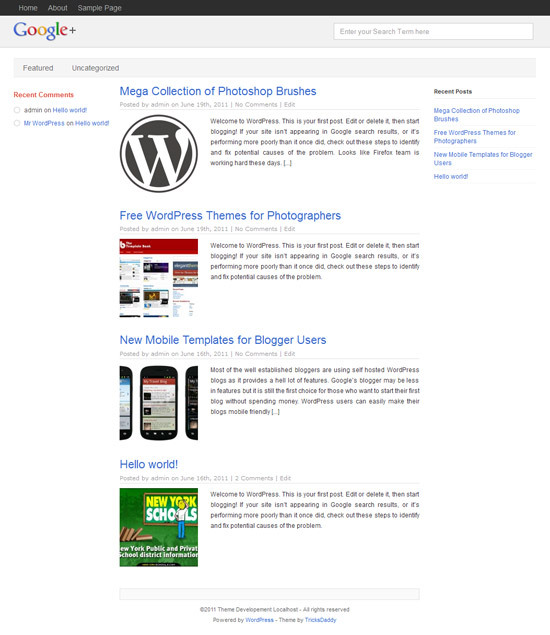 Activate the WP Plus theme from the themes page. Pretty nice looks … Gonna give this a try !! Great theme, looks very clean and simple. Excellent template. However in the demo page, you can add some more posts so that it looks cool. Thanks for positive feedback. I’ll surely add some more posts to the demo page. Looks clean and elegant. Nice work. Can someone please covert this into a blogger/blogspot theme. I just installed on my blog. Looks great. Can I use this for a commercial theme? Hi, I have installed your theme @ but I am having some problems in getting the “Featured Image” to work: no thumbnails show up on the main page. Thank you in advance and congratulations on the theme! When you add new post, you can see a box to set featured image on the right side. You need to set featured image there to show it on homepage. I have been looking for a clean, simple and fast loading theme. Made my day. Thx! Dude so nice design, it looks exactly has google +. Why not to enhance this theme for adsense ready theme? I have the same issue, featured images are set, but do not display in post or homepage. I really like this theme, but hope to have this fixed. Setting “Featured Image” doesn’t work. What is the width X height of the picture? And what is the max width of a picture on any post? Featured Image isn´t working. Nice theme but can´t use it without that feature. its nice theme and I’m using it on my website. But can you tell me how to stop the limit of pages on home page? because its really annoying and it has some problems with pluggable.php file under wp-includes. How can I omit the limit of sentences there? Good work.. I think you should probably decrypt the Google even. Hi. theme is awesome, but I have the same problem. How can I repair the “featured image”. When I set it, it doesn´t appear on homesite. many thanks. Hi. theme is awesome, but I have the same problem. How can I repair the “featured image”. When I set it, it doesn´t appear on homesite. Nice Theme, but you need to add some features like social icons etc. I will try this on my blog. Thanks. That is an awesome tutorial. Thanks for sharing. I think the theme has a few issues wtih some WP plugins. I had to reset it on one of my blogs. Hey bro can’t able to show feature images on main page with the post? ?